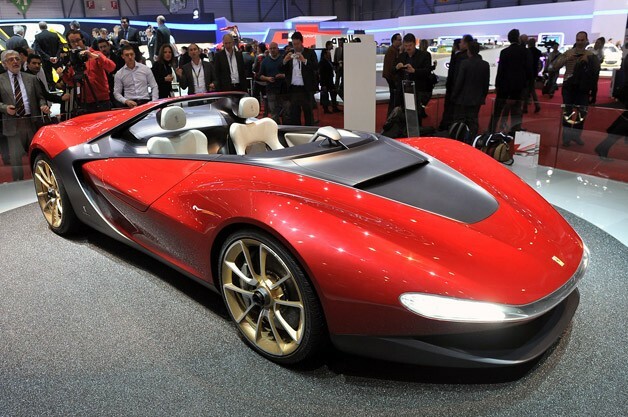 To give you an idea of the ethos behind this concept, consider this fact: The Pininfarina Sergio comes with its own custom helmets for the driver and passenger. And yes, they match the sensuous red and black scheme so artfully applied to the car itself. Form and function, rolled into one machine. It is, quite fittingly, based upon the guts of a Ferrari, the 458 in particular, as the Italian design house is most commonly thought of as the styling center for the Italian supercar manufacturer. Performance specs are as follows: 0-62 in 3.4 seconds and a top speed of 199 miles per hour, courtesy of Ferrari's 570-horsepower 4.5-liter V8 engine. According to Fabio Filippini, design director at Pininfarina, "We were motivated by the spirit of Pininfarina's best sports cars, Ferraris of the '60s and '70s designed under the leadership of Sergio Pininfarina. In particular, the Dino Berlinetta Speciale of 1965, the Ferrari 250 LM, the P5, the Modulo, and the Mythos." We'll leave the subjective points of the car's styling to you, but we will say that the overall wedge shape, lack of windshield and forward-canted roll hoop are nothing if not memorable. If you like what you see, you'll be pleased to know that Pininfarina says it is "a real car that can easily be produced in limited series of a few units." In other words, get out your checkbook.